Makes dislodging large rocks or boulders, uprooting old tree stumps and digging trenches easier than ever. The heavy-duty Utility Spade was made in the U.S.A. to last long and stay strong. With a 41” blade made of T1 steel and solid double welded, it digs up to 12” deep. Boulders, stumps and trenches will be out of your way in no time. Made of T1 steel and double welded on the top and bottom joints for strength and durability. Remove old stumps and rocks with little physical effort. The Utility Spade can be put to use on a number of jobs around the farm or ranch. Check out the media available for Utility Spade. Some rocks or even boulders can be too tough to move or dig out. 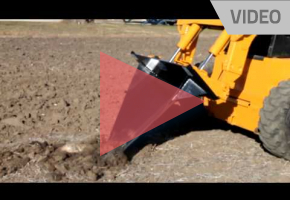 The skid steer mounted Utility Spade can easily remove them and move them to another location. Want more information on the Utility Spade? Here are some helpful downloads.